One easy trick to take roasted vegetables from good to holiday-worthy. One easy trick to take simple roasted vegetable recipes from good to holiday-worthy. Roasting is the easiest way to prepare veggies this time of year (especially if you use our foolproof method for roasting vegetables), but all alone, they can seem a little pedestrian for the holiday table. Which is why I use a secret weapon: easy sauces to dress them up. Drizzling a simple, savory sauce over your roasted vegetables serves two purposes. For one, it may pique your kid’s interest, as it does mine, especially when I serve the sauce as a “dip.” Also, it makes a seriously easy recipe look much fancier than it is. In other words, it may impress my mother-in-law. And that alone is worth giving these recipes a try. Related: How to roast vegetables: A foolproof method for the best fall and winter produce. 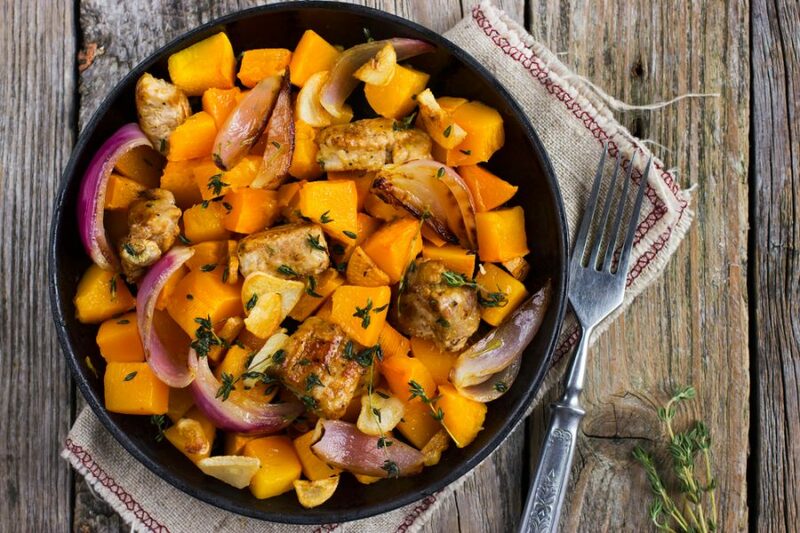 Squash is a holiday table staple. 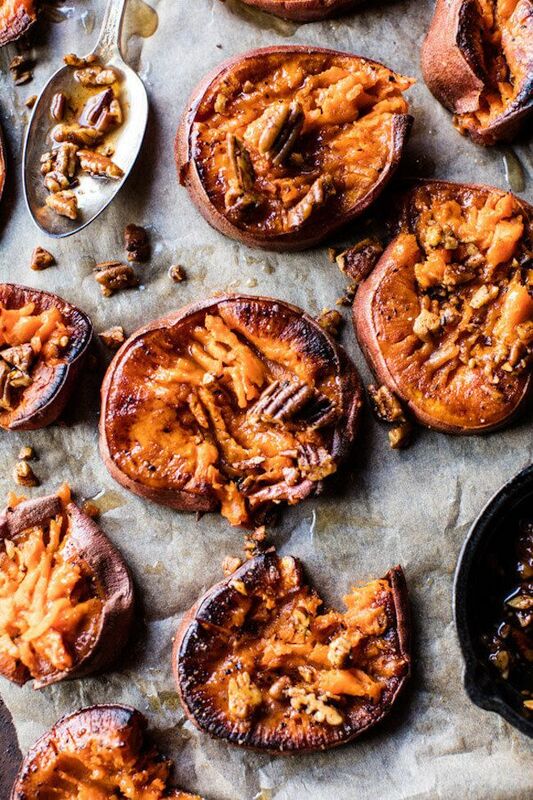 If you want to keep it as decadent as all those cheese and breadcrumb laden squash recipes without nearly as much work, try this Roasted Squash with Ginger Shallot Brown Butter (above) shard at new York Metro Parents from one of our favorite family cookbooks, Make It Easy. We’re biased, as the book is by our editor, Stacie, but come on: a bit of tang from ginger paired with rich melted butter sounds to-die-for. 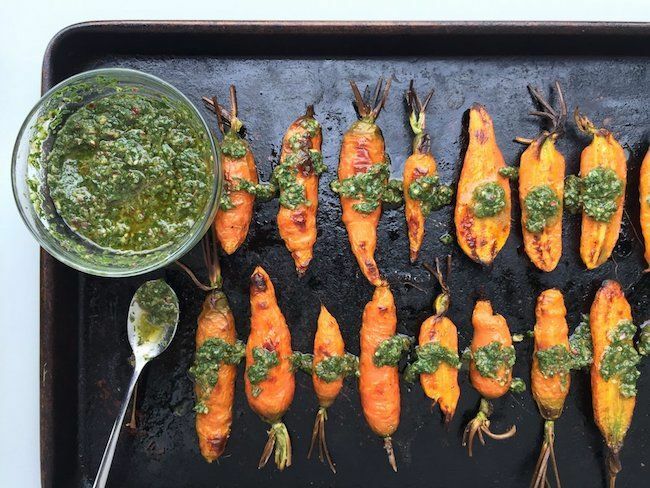 I’m planning to set my kids up with vegetable peelers so that they can prep these Roasted Carrots with Chimichurri at More Icing than Cake while I work on the sauce. The recipe calls for using the carrot tops in place of parsley in the chimichurri, which means saving a few cents at the grocery store and using something that would normally be tossed. But maybe the best part is that it’s one fewer ingredient to remember. Brussels sprouts are a must at my holiday meals, but they’re not exactly a kid-favorite. 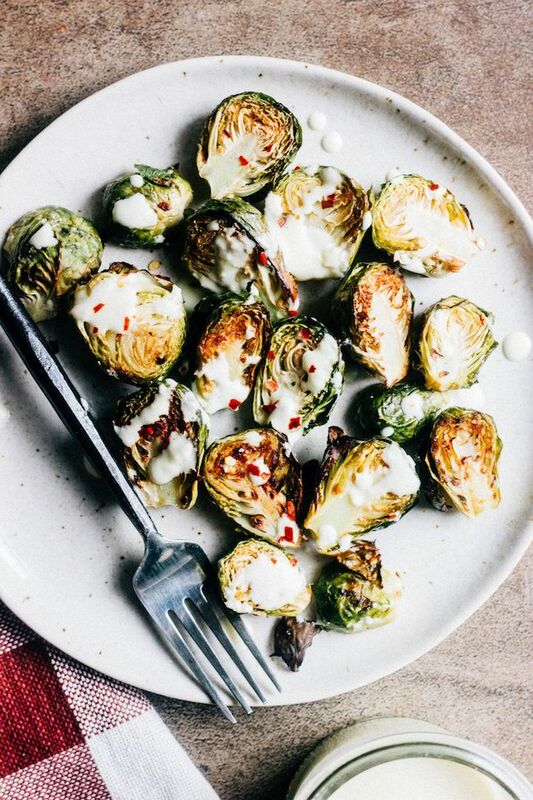 This recipe for Brussels Sprouts with Lemon Parmesan Sauce at Whole Bite Blog might just do the trick, though. For Thanksgiving, I plan on putting the sauce in a bowl on the side for people to pour on themselves, or for the kids to use as dipping sauce. 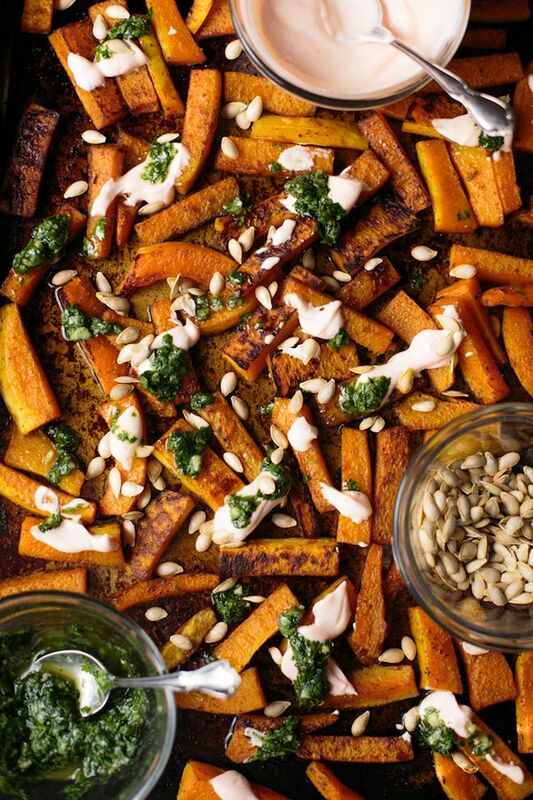 The recipe for Butternut Squash with Cilantro Garlic Sauce at This Wild Season is so easy — literally cut and roast — but the sauce takes it to a whole new level. I mean, garlic and cilantro with a kick of sriracha and crema too?! Man, these are basically sweet potato fries with a killer dipping sauce. Who won’t get down with that? I’ve never been a huge fan of sweet potato casserole because it’s usually so, so sweet, but I’m up for trying these Crispy Roasted Sweet Potatoes with Bourbon Maple Butter at Half Baked Harvest. Slicing the potatoes first and then roasting them until crispy will cut some of the sweetness, as will the bourbon in that Bourbon Maple Butter. And since it’s a sauce, you can go light to control the sweetness…if you want. 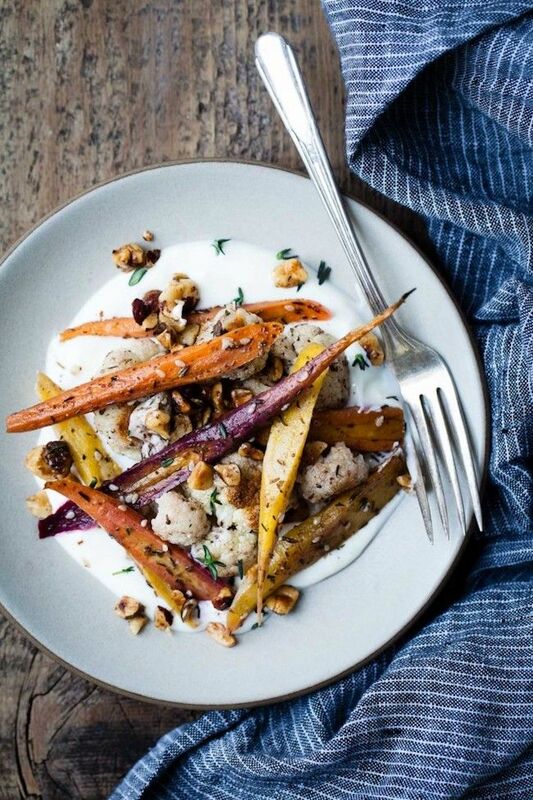 If you’re looking for a seriously easy sauce that will still wow your family, try this recipe for Cauliflower and Carrots with Salted Yogurt Sauce at Snixy Kitchen. You need just three ingredients for the sauce, and it’s such an interesting Mediterranean twist on traditional holiday flavors. This one may get licked off the plate if I’m not careful. 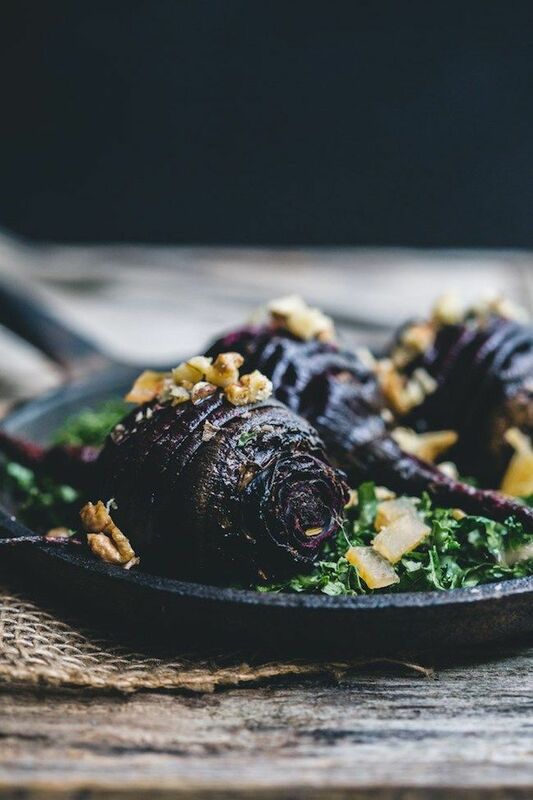 Of course, we’re fans of crispy, cheesy, buttery Hasselback potatoes, so when I saw this idea for Hasselback Roasted Beets with Horseradish Sauce at My Goodness Kitchen I was intrigued. Adding a creamy, tangy horseradish mayo to earthy beets sounds divine. And these are definitely gorgeous enough for any holiday meal. Related: How to make Hasselback potatoes in 5 easy steps. 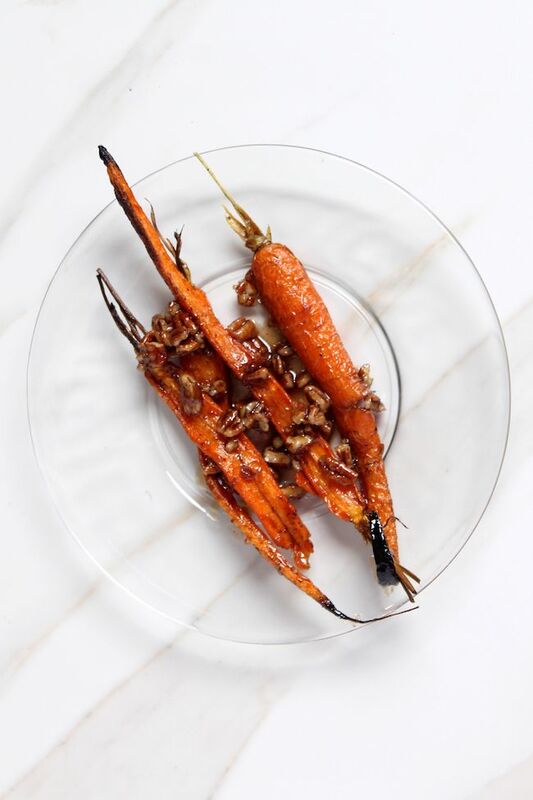 Whoa, the brown sugar, butter, and whiskey sauce that’s poured over this recipe for Whisky Roasted Carrots at The Arrangement Bar looks utterly amazing. In fact, there’s no reason why this sauce should be limited to carrots. I could happily put this on everything from ham to bread pudding. Is whiskey sauce the new gravy? I think that I might be on to something.